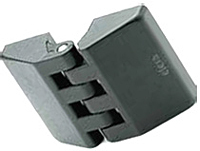 Monroe Hinge offers a wide variety of plastic hinges including plastic living hinges, CFC, CFD and many more. Monroe can also manufacture plastic hinges to your exact specifications and will are equipped to produce special and fabricated hinges and perform such operations as hole punching, forming, offsetting, notching and etc. Holes can be added depending on quantity requested. We are an ISO 9001:2015 & AS9100D certified manufacturer of plastic hinges. Many sizes to meet your needs and they are in stock now! Are you looking for Plastic Hinges?